EPLAN Software & Service GmbH & Co., a provider software for global engineering solutions, has released 2.6 version of EPLAN Platform P8. With the new EPLAN Platform, version 2.6, users benefit from substantial engineering features that can easily be integrated into everyday work processes, including new functions for terminal design and project data management, the representation of piping in fluid power engineering, and optimised IT integration. English, German, Japanese and Chinese: EPLAN software previously 'spoke' just seventeen languages. With the new version 2.6, Turkish has been added to the software languages - after all, EPLAN has been running its own affiliate company in Istanbul since 2014. There are also numerous technical upgrades in the newest version. Used accessories can now easily be depicted when processing and managing terminal strips. Furthermore, automatically or manually defined jumpers can also be easily identified. Users also have the possibility to display the current terminal status as it is represented in the Navigator. Yet another improvement: a new connection-oriented view quickly shows which terminal connections are still free and therefore available. Aside from these functionalities making designing simpler, they also significantly accelerate design engineering processes. Using the Quick Input Filter for project management makes it even easier to process and manage projects and project data. Subprojects are freely definable and can be saved at will, and there is more flexibility in name allocation. For instance, users can only update the main project instead of storing subprojects with the goal of bringing the main project up to date. In project structure management, certain structures can be searched for and revised throughout the entire project, which considerably simplifies project oversight. The definition of sequencing pages for print or PDF outputs has also been appreciably enhanced - and users also benefit from faster results in this area. For hydraulics and pneumatics, for cooling and lubrication: numerous applications require the use of pipes or hose lines to transport media such as air or oil. EPLAN Fluid Professional, including the EPLAN Pro Panel add-on, now offers the possibility to represent piping and hydraulic hose lines directly in 3D with complete layout functionality. Design engineers can thus review the layout or for instance the length of the hose lines. An export function is also provided in order to transfer the pipe geometries to an external manufacturing software for pipe bending. Many new functions were optimised to simplify integrating EPLAN Platform into customers' existing processes. EPLAN Preplanning now allows data from external sources to be imported. A preview function allows incoming data to be verified before being imported. Differences are easy to recognise and even previously deleted objects can now easily be found and removed from preplanning and detail engineering. This represents the next step toward more data consistency and data continuity within design engineering - from preplanning through to detail engineering. User management has also become easier: existing users can simply be imported into an IT infrastructure instead of having to create a new user. EPLAN user rights management was expanded with support for Active Directory. The use of SQL databases has also been made simpler: a selection list of available SQL databases is available from which to select the correct one. EPLAN Pro Panel Professional is the software-based engineering solution for design and construction of control cabinets, switchboards and flexible power distribution systems for the power supply in 3D. Whether based on electrical or fluid power schematics or based on device and connection lists provides by ERP systems or manually created and provided in MS-Excel format: Seamlessly integrated in your PDM and PLM landscape, EPLAN Pro Panel Professional covers the entire range of services in control cabinet, panel and switchgear building - from the mounting layout in 3D, through the virtual wiring of the components to the individual design and adaptation of copper bars for flexible power distribution systems. EPLAN Pro Panel Professional provides all necessary data for manufacturing like BOMs, drawings and flat projection drawings and integrates automation technologies perfectly in the processes of product development and manufacturing. This applies to the mechanical processing of the cabinet housing components or copper bars as well as for the control of machines in the cable and wire assembly. Even future-oriented automation technologies such as automated assembly of terminal strips or the robotic wiring of equipment are supported. 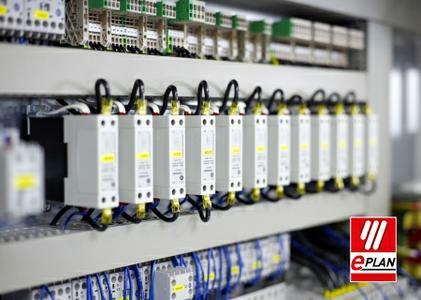 About EPLAN Software & Service GmbH & Co.
efficient engineering solutions to enhance their electrical design. With a presence in over 50 countries across the globe, a professional electrical engineering consultancy service is always close to hand, regardless of your companies location. More than 40,000 customers-from international firms to sole traders, throughout a range of industries, are using our electrical CAD solutions to enhance their electrical design processes.